Jorge was extraordinary, superb overview of Rome both physically and historically. Best money ever spent on tourism. This was the best thing we did in Rome. Nora was a fantastic guide!! She took us to all the major attractions, one of her favorites, and anywhere else we wanted to go in 3 hours. The only thing I would do differently would be to take the 6 hour tour w/lunch. We had many recommendations to do the golf cart tour so signed up as a couple to do a private tour one afternoon. Our driver Greg was excellent and really wanted to make our experience personal and also to make sure he showed us our requests. Three hours flew by and we were sad to see the afternoon end. 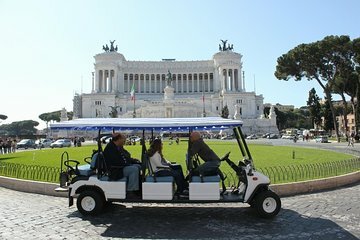 We recommend this tour if you are looking for a personal, knowledgeable and friendly way to see so much of Rome and learn of the history surrounding the sights. Thank you for the great communication from booking the tour through the completion of our experience. Excellent. Guides knew their stuff. Gave us options and went in with us. Many helpful acecedotes. They really enjoy what they do. We really enjoyed just being by ourselves on this small tour. Being in a golf cart made it easy to get in and out of tight spots. We didn’t have to waste time sitting in traffic. Our tour guide was born and raised in Rome and new all the places I go for a great city view and for pictures. What a wonderful job George did on showing us a closeup private view of many parts of central Rome. We felt so privileged and he was so charming and knowledgeable! Our guides (Leona and Benedict) were truly wonderful!! Leona even bought us a cappuccino on one of our stops! They knew everything there was to know about Roman history! A great experience for our family!! !